Join us for a free historical backstage tour of The Paramount Theater! Learn about The Paramount’s beginnings in 1931 and our long legacy of community involvement from the Great Depression to the magical reopening! Discover the movers and shakers behind The Paramount’s construction, movie palace architecture, and the behind the scenes details of the two–year long restoration! See the backstage Wall of Fame, where hundreds of artists have left their autographs and more! Tickets are free. Reservations for the tour are strongly recommended, as space is limited. The behind-the-scenes tour will be about forty-five minutes in length. Cameras are welcomed on the tour. Food and drink will not be permitted inside the theater. Schedule for Tours: **Tour Schedules are Subject to Change. Please confirm date and time at least 48 hours before the tour. Group Tours are always available by appointment. Please contact the Theater for more information: 434-293-1001. Add to Calendar 06/08/2019 11:00AM America/New_York Tour The Paramount Theater! 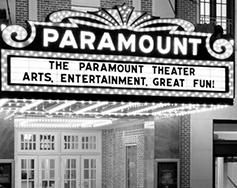 Tour The Paramount Theater!